The Tin Whistle Song Book With Letter Notes includes the sheet music and easy to follow letter notes for over 100 well known songs including some Children's songs and Christmas Carols. This is the first time such a book was published to include the letter notation along with the sheet music. This book is also suitable for other musical instruments such as the piano keyboard, the banjo/mandolin and recorder. You don't need to be able to read sheet music to play any of the songs in this book. This Tin Whstle song book has over 100 well known folk songs. 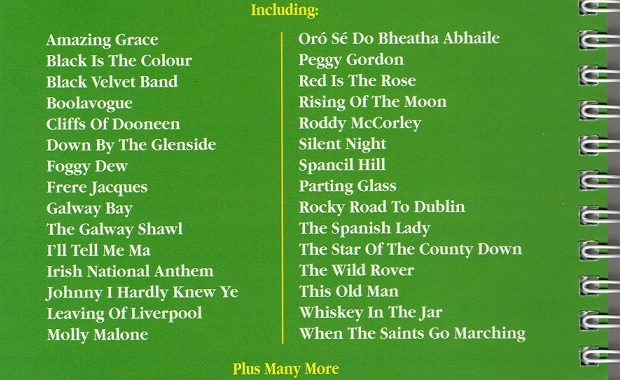 There's also a selection of children's songs and some well known Christmas Carols. 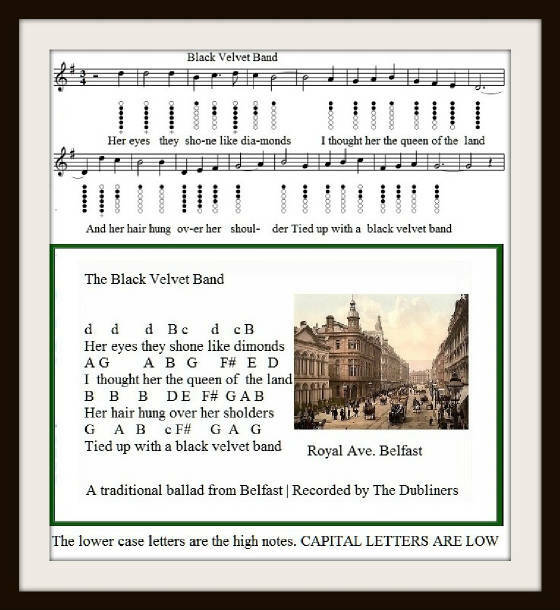 Along with the sheet music I have included the ''Letter Notes''. Millions of people start off using basic letter notes before moving on to reading sheet music. Those who use letter notes will already be familiar with the tune of the song they are trying to learn. The melody is in their head and all they want is somebody to tell them which notes to play. In this book I place the notes to play over the lyrics. For example If the note is a low D then I use CAPITAL letters and if the note is a high d I use lower case letters. All the songs are in easy keys such as D and G. Every song can be played on a D whistle. These easy to follow letter notes are also suitable for other lead instruments such as piano accordion, banjo, keyboard, mandolin and recorder. It takes a bit longer for some people to learn how to read sheet music. This is where placing sheet music in the book beside the letter note version of the song comes in handy. When your reading the letter notes you can also see the notes on the sheet music and the similarities, you might see a song starting off that has three D notes in the letter note version and you'll notice three whole notes on the sheet music version at the start. After a while you'll begin to get better at reading the sheet music and may not need the letter note version again. There are millions of people out there who would dearly love to be able to play a musical instrument and the thought of having to learn how to read sheet music seems to daunting a task. Some people might say let them stick at it and they'll eventually be able to read music. Well perhaps some would, but a large proportion give up and will never know the joy of sitting at their kitchen table playing their favorite song or tune. I think that's a shame and that's the reason I included the basic lead notes in letter note form. If these letter notes I have made up help just a handful of people along their way then all the countless months I spent working on them will be worth it. So this book will be a God-send to those who don't read sheet music. Where possible I have included the lyrics inside the sheet music, but in some songs the notes are packed too tight to be able to do so. This is the biggest collection of ''Songs'' ever to be placed together in one single book. Reviews , well it's only a month since I launched the book and I have had some great feedback. Thanks to all who bought the book. Thanks Raymond, it was hard work putting it together but well worth it. 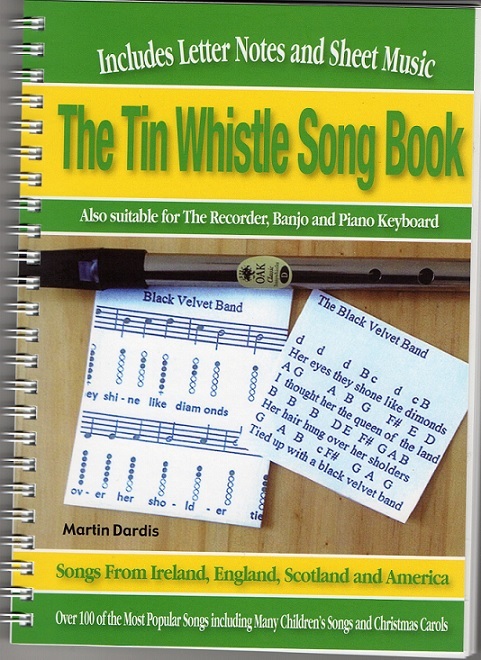 Just received this fantastic book which is an instant start to playing the tunes you know on the tin whistle. It is simple and printed clearly on every page to get you playing at a rate of knots, a must for every tin whistle owner. Suitable For All Lead Instruments including banjo, piano keyboard and recorder. A Massive 119 songs in total.